Create the perfect combination of slightly tart, sweet and savory with these apple, prosciutto and cheese crostinis from blogger Amy Dong of Chew Out Loud. Melted brie and flavorful Prosciutto di Parma with (of course) fresh, seasonal apples make this appetizer one for the books. Serve at football parties to upgrade from the standard wings and nachos, or make this small bite the star of your holiday get-togethers. 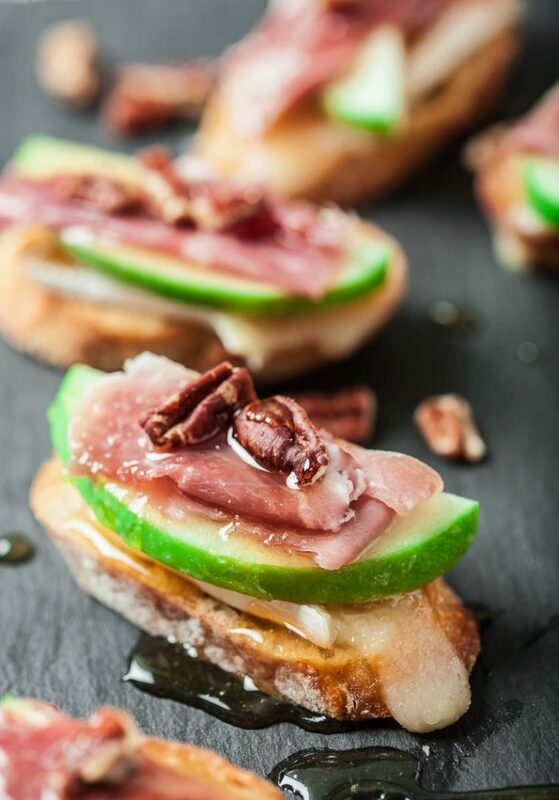 Every guest is sure to love this apple, prosciutto and cheese crostini and be sure to pair with a glass, or bottle, of sparkling wine like Lambrusco or Cava. Preheat oven to 375F, with rack on upper middle position. Line a large baking sheet with foil. Place baguette slices in a single layer on baking sheet. In a small bowl, combine melted butter with olive oil. Use a pastry brush to brush butter mixture evenly on both sides each baguette slice. Bake 8-10 minutes or until slices become golden and crispy. If needed, flip crostini over to allow crisping on the bottom side for a few minutes. Remove from oven as soon as it’s done. Slice apples into 1/4 inch slivers and sprinkle with fresh lemon juice to prevent browning. Place a slice of brie over each crostini, followed by apple slices. Gently slice each prosciutto piece in half and place over the apple slices. Top each crostini with a few pecans. Drizzle with honey and serve.